The Cabinet of Ministers of Ukraine has launched financing of loans taken for energy efficiency in 2018 in state-owned Oschadbank, Ukrgasbank and PrivatBank. According to the press service of the State Agency for Energy Efficiency and Energy Saving, from April 18, 2018 citizens can use the government's residential energy efficiency financing program I the authorized banks and receive refunds. The agency recalled that 20% will be refunded for purchase of non-gas burning boilers (35% for recipients of subsidies), 35% for insulation of houses and 40-70% - for insulation of high-rise apartment buildings by homeowner associations. In addition, private households and homeowner associations would be able to receive additional compensations from local authorities. The respective programs are in effect in 62 cities and towns. 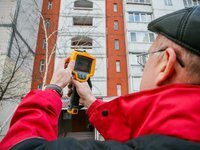 The Cabinet of Ministers of Ukraine provided UAH 400 million for compensation of loans taken for energy efficiency in 2018, including UAH 190 million for homeowner associations. Since the launch of the program in October 2014, over 400,000 families have taken over UAH 5 billion of loans for energy efficiency.